James Sanders leads Conjunto, an adventurous Latin jazz ensemble. 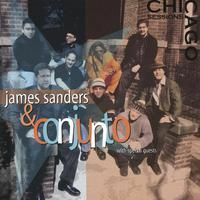 Moving confidently from Afro-roots to jazz improvisation, James Sanders and Conjunto are equally at home at a salsa dance party, jazz club, or festival stage. In Conjunto, intricate instrumental virtuosity and propulsive dance rhythms find equal footing in a cohesive whole, making music for mind, body, and soul. Sanders is a classically trained violinist with a Masters degree in performance from Yale University. Shortly after earning his degree, his attention was drawn to both jazz improvising and the Latin music he absorbed growing up as the son of a Dominican mother in a diverse urban environment. Conjunto is Sanders’ ongoing project to unite his classical training and theory with the freedom of jazz improvisation, all grounded in the lively rhythms of the Caribbean: rumba, bomba y plena, bolero and more. The result is performances that move audiences figuratively and literally, where moments of hushed intimacy are followed by joyous dancing. Conjunto's repertiore ranges from Afro-Cuban classicas ala Buena Vista Social Club to Latin arrangements of jazz standards, fusion and the Great American songbook, plus original material written by Sanders. Conjunto's core line-up consists of Sanders' violin plus keyboards, bass, congas, percussion and woodwinds. A somewhat larger version adds a drum kit and vocals. The ensemble expanded to include trumpet, cello, additional bass and percussion, guitar and a dance company for a special headline appearance at Chicago's Pritzker Pavillion in Millennium Park during the World Class Jazz: Made in Chicago series. Conjunto has recorded two albums, Live in Little Village and ChicagoSessions.